The time is right to build a production environment ready for next-generation 4K and 8K video. Specifications have matured significantly since 1995, when NHK first broke ground in UHDTV systems research. SMPTE (Society of Motion Picture & Television Engineers) later established UHDTV video format specifications in 2007, followed the next year by 22.2 channel audio format specifications. Finally, UHDTV parameters were recommended in an international specification by ITU-R (International Telecommunication Union Radiocommunication Sector) in 2012. In Japan, a series of meetings held after the publication of an official 4K/8K roadmap have paved the way for next-generation broadcasting. The second interim report in July 2015 called for pilot 4K/8K satellite broadcasts (using right-hand circular polarization) to begin in 2016, followed by actual broadcasts in 2018 (using left-hand circular polarization), aiming for widespread adoption in anticipation of the Tokyo Olympics in 2020. 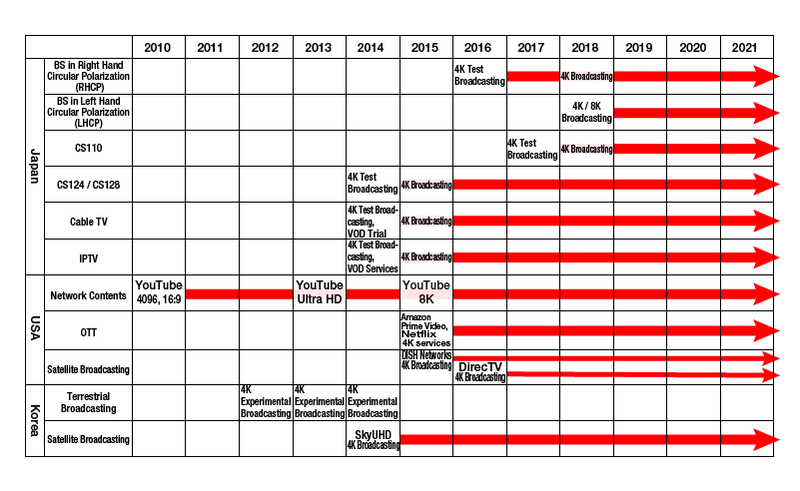 Technical specifications for next-generation 4K/8K broadcasting services have been investigated, verified, and evaluated by a group formed in 2013 called the Next Generation Television & Broadcasting Promotion Forum (NexTV-F), which led efforts to test 4K broadcasts from 2014. NexTV-F merged with the Association for Promotion of Digital Broadcasting (Dpa) in April 2016 to form the Association for Promotion of Advanced Broadcasting Services (A-PAB). As for 8K, NHK has organized pilot satellite broadcasts (on channel 17, using right-hand circular polarization) from August 1, 2016. Preparations are underway for adoption in 2018. In the U.S., YouTube helped pioneer high-resolution content online in 2010 by supporting 16:9 video with a horizontal resolution of 4096 pixels. Support for UHD was introduced in December 2013, followed by support for 8K in June 2015. Since companies in various industries formed the UHD Alliance in January 2015, this group has promoted content production at and above 4K resolution. 4K content became available for streaming from Amazon Prime Video and Netflix as of September 2015. Although the broadcast industry had long taken a wait-and-see approach, it finally responded as the environment for 4K streaming became more fully established around 2014. Satellite TV company DISH Network introduced 4K service in summer 2015, followed by live 4K programming from DirecTV in 2016. Meanwhile, the four leading networks of ABC, CBS, NBC, and Fox are moving ahead in 4K broadcasts of live sports events. In South Korea, pilot 4K terrestrial broadcasting began in 2012, followed by trials over a period of a few months in 2012–2014. 4K cable TV broadcasting was initially tested in 2013, with satellite broadcasts by SkyUHD the following year.